The story that George Hendee first met Oscar Hedstrom in December 1899 during the races at Madison Square Garden is possible, but not likely, and it certainly wasn’t at the New York Cycle and Auto Show the following month. It remains pure speculation as to when and where they first met, but since both men were bicycle builders and racing champions working within the same regional network, it could have been almost anytime between 1895 and 1901. While they had that in common, Hendee’s focus was on business and Hedstrom’s on mechanics, and both were highly regarded for their skills. It was a partnership that would, within a decade, create the largest motorcycle manufacturer in the world. 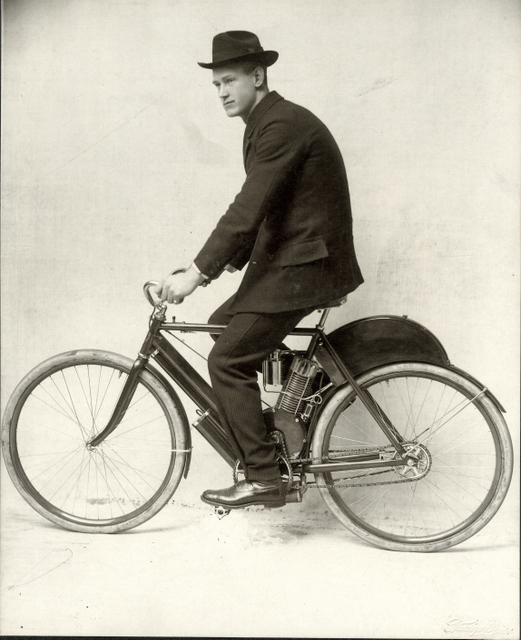 Oscar Hedstrom in Spring of 1901 with his very first prototype motorcycle, built for George Hendee. 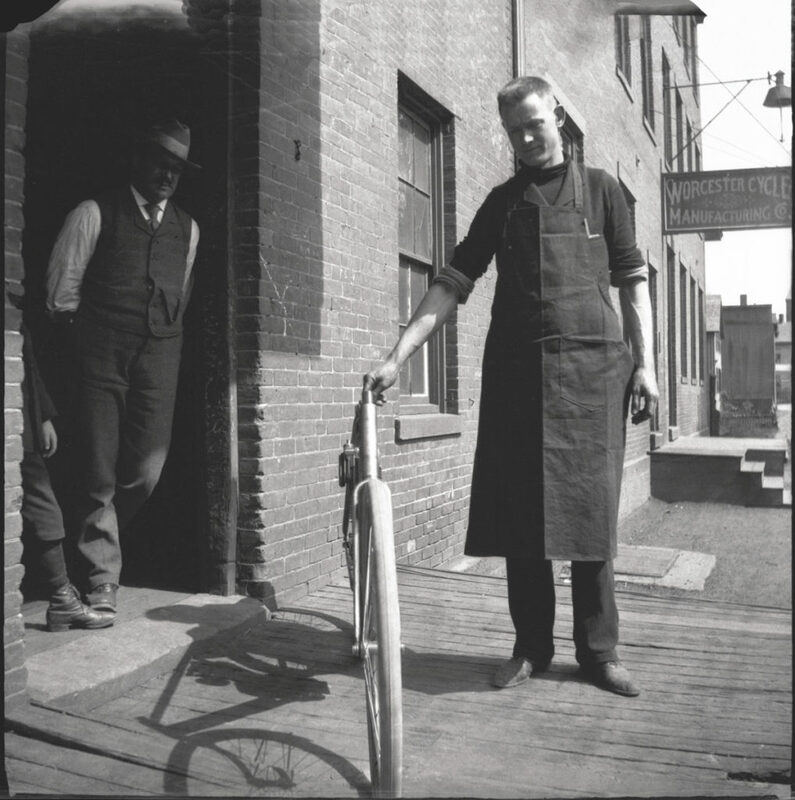 Note the Worcester Cycle Manufacturing Co. sign: the location was Middletown, Connecticut, where Hedstrom rented workshop space (including the use of tools) for $1/day. This prototype was finished by May 1901, and taken to Springfield for demonstrations at Hendee’s facilities there. When Hendee decided to enter the motor bicycle market is also open to conjecture. What we do know is that George Hendee and Oscar Hedstrom signed a partnership agreement sometime early in 1901 and leased Hedstrom’s former shop, Worcester Cycle Mfg.—then in receivership—to create the prototype motor bicycle. By the end of April the press was reporting that Hedstrom was building a machine for the Hendee Mfg. Co. and that “hereafter he will be identified with that concern.” The curious thing is that the frame—designed specifically to fit Hendee and Hedstrom—was not built by Hedstrom. Oscar Hedstrom with the finished prototype in 1901: note there’s still no Indian script on the fuel tank. 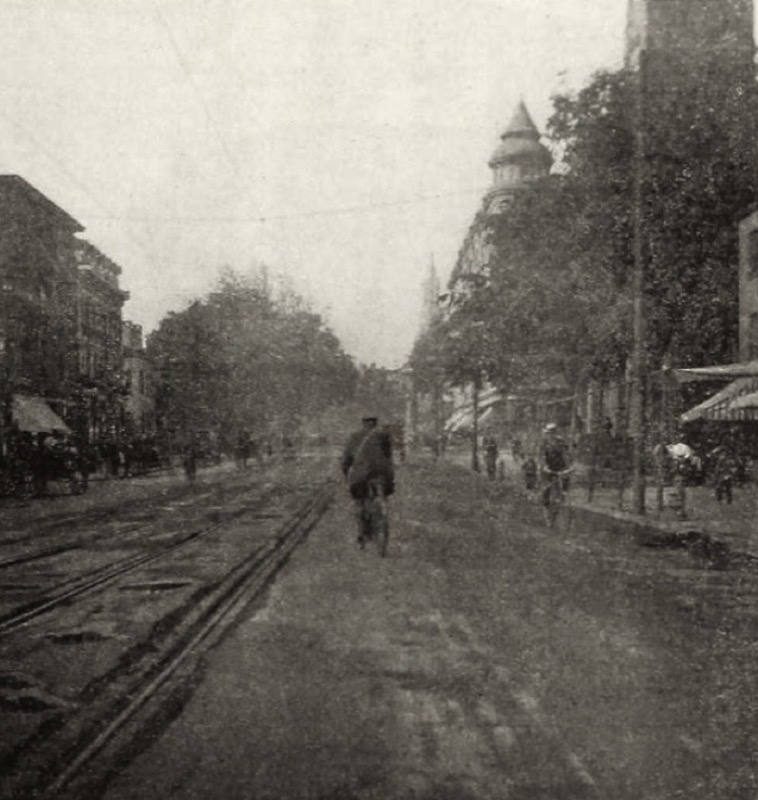 The first tests were conducted in Middletown, Connecticut, and on May 25 Hedstrom and the motorcycle arrived in Springfield, Massachusetts, by train. 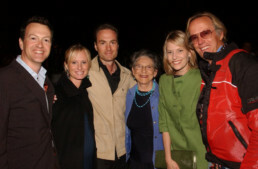 The launch of the Hedstrom’s motor bicycle took place on Saturday, June 1, at the Cross Street hill in Springfield where a reporter at the scene described a crowd of 400-500 people watching as Hedstrom rode his machine up the 19-percent grade of the loose-gravel street with power to spare. Indian motor bicycle production didn’t begin until the fall. The pacing team of Henshaw and Hedstrom was still in evidence and they gave a half-mile, motor tandem exhibition in Buffalo on August 7 in which they broke the world record with a time of 39.2 seconds. On August 12 they establish a new mile record for motor tandems and won the 10-mile motor tandem race. Even as late as August 15, it was reported that Hendee was still in the process of raising the necessary capital for the venture and that the Indian prototype was on display in a retail store in Springfield. It’s safe to assume that Oscar Hedstrom didn’t depart for Illinois to begin working with the Aurora Automated Machine Manufacturing Co. until at least late August. By 1903, Hedstrom would begin a series of annual forays to Ormond Beach Florida (Daytona), where he could test the speed potential of his machines to the full. This experimental racer is considerably different than the production Indians, having a full tube frame (with swan-neck front downtube) and no engine as a stressed frame member. It has no pedals, a large intermediate sprocket for higher speed, different tinware, and racing bicycle handlebars. At the end of October, Oscar Hedstrom filed for several patents, including a chain adjuster, an engine valve, a control mechanism for engines, and the iconic camelback fuel and oil tank. Obviously the motorcycle was in production by this date, but the deal between Aurora and Hendee Mfg. wasn’t announced to the press until the beginning of November. The Bicycling World & Motocycle Review stated that Aurora had been testing the machine and that “motors are expected to be delivered by the end of the year.” On November 7, an Indian motor bicycle was displayed at the New York Auto Show and a week later George W. Sherman sailed for England on the Oceanic to attend the Stanley automotive show. The first advertisement for the Hendee motorcycle appeared in November 1901 – note no mention of the Indian name in the ad, nor any Indian script on the ‘camelback’ fuel tank. A second shot of Hedstrom at Daytona in 1903 aboard his specially-constructed land speed racer. It has been reported that only 137 motorcycles (the Smithsonian claims it was 143) were produced in 1902, yet this year’s model in the Smithsonian Institution is serial number 150. Hedstrom didn’t file for a patent on his famous carburetor until May, which suggests he was still fine tuning it even during production. There were other issues. In March 1904, Alex Levedahl, president of Aurora Manufacturing, stated in a lecture to the Chicago Motor-Cycle Club that casting a cylinder was difficult and only about 40 percent were good. Also, every engine that arrived in Springfield was completely disassembled and reassembled, and every motor bicycle was tested on the Cross Street hill before shipment—if it didn’t pass, it went back to the shop and was adjusted or fitted with a new engine (hence the serial number discrepancy). This engine work was personally supervised and inspected by Hedstrom, plus he did the adjustments on the carburetors. It’s not surprising that deliveries couldn’t keep up with orders and this would remain a problem until 1904. 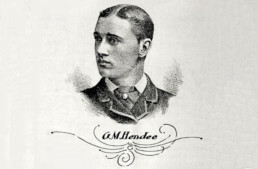 George Hendee in 1902 during the Hartford-Boston-New York endurance race, which he won. From the very beginning, advertising for the Indian was based on its superiority over the competition, and Hedstrom’s reputation as a mechanic. George Hendee winning the famous endurance races in 1902 and 1903, proved that the Indian could reliably carry a 243-pound man over the atrocious roads of that era and that mechanically it was superior to the other makes in these competitions. 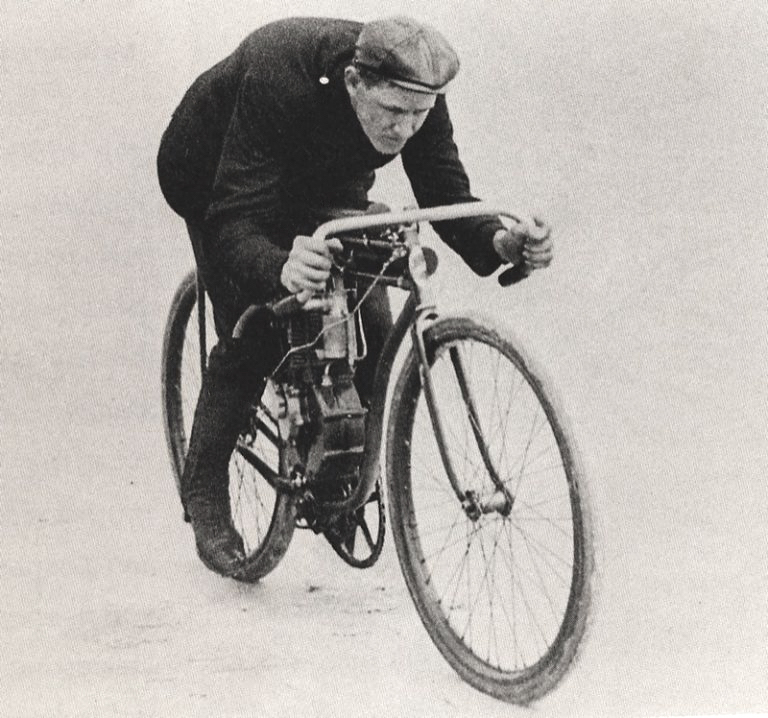 It is also important to note that in the 1902 endurance race Hendee’s bike was fitted with the prototype Indian twist grip, just one example of these competitions being used as real-world testing grounds for Hedstrom’s inventions. Advertising capitalized on these wins and the reputation of the two men, so a lost victory was taken personally. 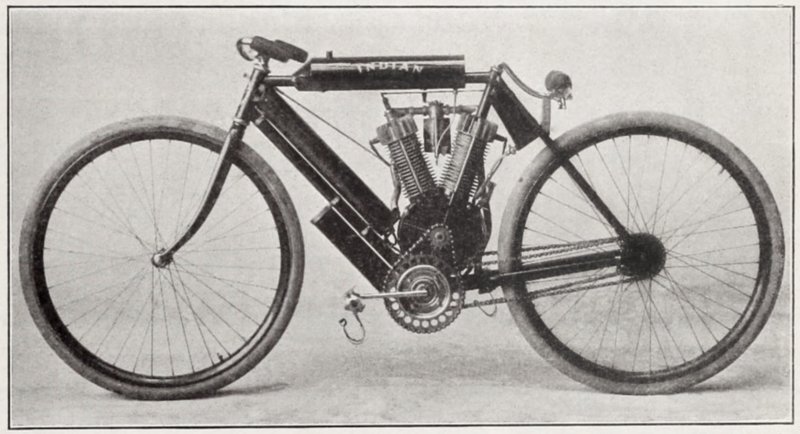 By 1904, Hedstrom’s experiments included the very first Indian v-twin: this iteration was a very special racing model with minimal saddle and bicycle racing clips on the pedals. 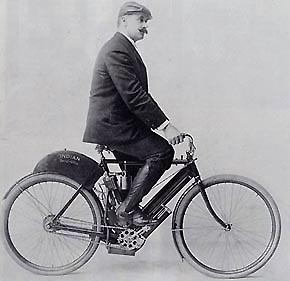 Oscar Hedstrom was favored to win the New York Motor Cycle Club’s hill climb on May 30, 1903, but Glenn Curtiss showed up with his 5-hp v-twin Hercules and easily beat all 14 Indians entered in the event. 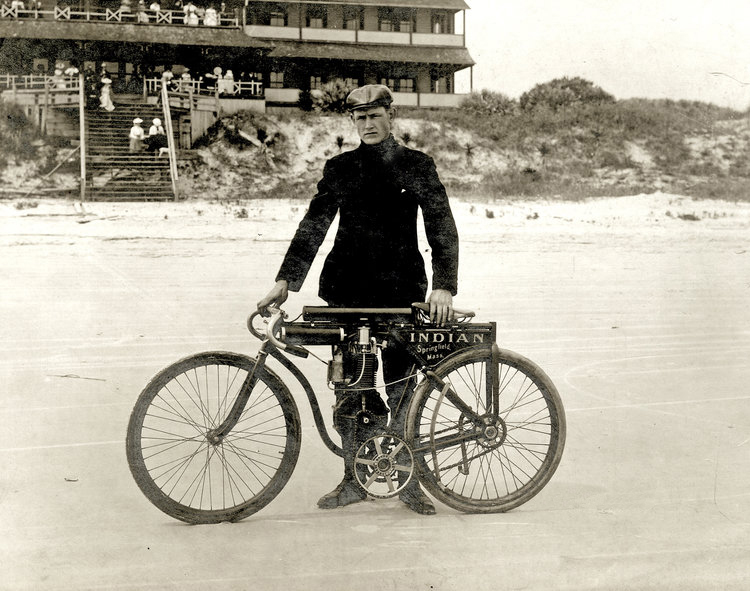 In September Hedstrom arrived at the Rhode Island Automobile Club race meet “on an Indian without pedals and with a motor of greater power than on normal Indians.” [This may be the same machine he took to Ormond Beach – ed]. Four months later, at Ormond Beach, Hedstrom arrived on a parallel dual-engine, 5-hp Indian to go head-to-head against Curtiss and his v-twin, but to no avail. Then, on August 5, 1904, Hedstrom showed up at Newport Beach, Rhode Island, on the first Indian v-twin. 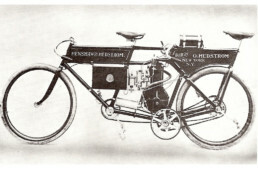 The 3-hp v-twin was run in Orange, New Jersey, on November 26 and raced at Ormond Beach in January 1905. One might consider this to be the origin of factory race programs being used for retail product development since the new 2.25-hp single-cylinder engine, designed to power the new Indian Tri-Car, was in production by November 1905. 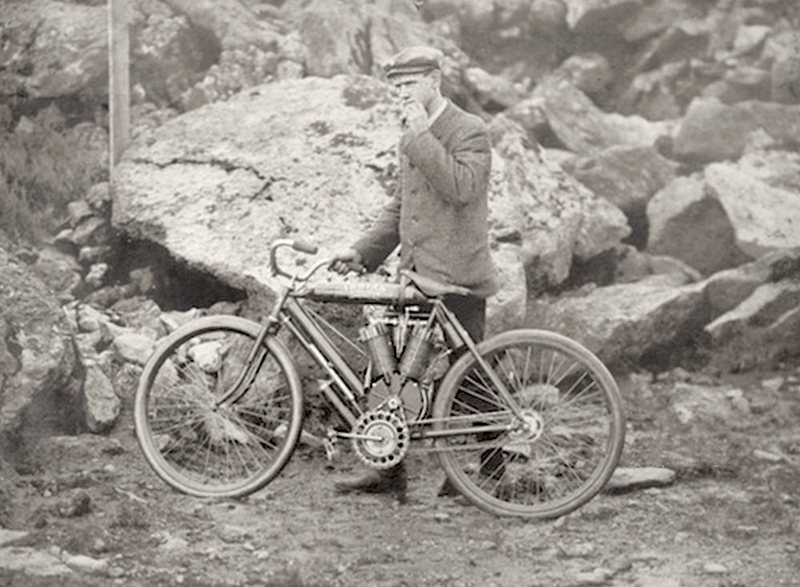 Hedstrom on the first Indian v-twin in 1904, in a rugged landscape (Newport Beach, Rhode Island? ), and with a slightly more orthodox saddle than the pure racing item seen above. The early history of Indian motorcycles is based on isolated facts published in contemporary news accounts and surviving ephemera, but there are tremendous gaps in our knowledge. Descriptions of the State Street factory in 1906 make no mention of forging or casting capabilities. When did the forging factory in Hendeeville (West Springfield) begin operation? Exactly when were the Indian assembly plants established in other countries? What did the Indian pace machines built in 1904 look like? Why were competing motorcycle brands using Aurora-produced Hedstrom parts not as successful as the Indian? Even the answers to basic questions—when did Hendee and Hedstrom first meet, and how many Indians were made in 1901—remain to be answered. With the reintroduction of the Indian brand, interest in the true history of this iconic American motorcycle company has been resurrected. It promises to be a great story. Read Part 1: ‘George M Hendee, Race Legend’ here. Read Part 2: ‘Hedstrom Sets the Pace’ here. Many thanks to Thunder Press for allowing TheVintagent.com to republish this article.